Lee Peacock joined Eurus Energy in 2016 and serves as Senior Operations Engineer. 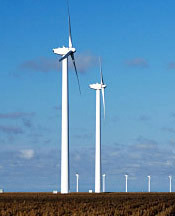 He is responsible for the operation and maintenance of EEA’s wind and solar projects. Prior to joining EEA, Mr. Peacock served as Senior Reliability Engineer for Georgia Power Company’s Metro South Region. He was responsible for designing solutions to decrease power outage frequency and duration. Mr. Peacock began his career at Georgia Power Company as a co-operative student in 2005 where he gained experience in the distribution group before beginning fulltime employment in 2010 as a Distribution Engineer. Mr. Peacock graduated from the Georgia Institute of Technology in 2008 with a Bachelors in Mechanical Engineering. He also earned a Masters of Engineering Management from Duke University in 2010. Mr. Peacock is a licensed Professional Engineer in the State of Georgia.